Providing you the best range of teicoplanin injections, ceftricare s (ceftriaxone sulbactam 1.5g injections), pantoprazole injections, docegem 80 injection, meropenacare injections and zolecare injection with effective & timely delivery. 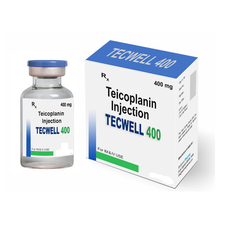 Teicoplanin Injections is a glycopeptide antibiotic. It is predominantly bactericidal both against aerobic and anaerobic gram positive bacteria. Used in Severe infections caused by gram positive bacteria, prophylaxis against gram positive endocarditis in dental surgery to high risk heart patients. Intra peritoneal administration to treat peritonitis in partients undergoing chronic ambulatory peritoneal dialysis. Our company is instrumental in offering optimum quality Ceftriaxone Sulbactam Injections to our valuable customers. Available to us in bulk quantities, these injections are widely used for the treatment of various forms of gram positive and gram negative bacterial infections. These drugs are available with us at highly reasonable market prices. Ceftricare™S Ceftriaxone is a third-generation cephalosporin antibiotic. Like other third-generation cephalosporins, it has broad spectrum activity against Gram-positive and Gram-negative bacteria & Sulbactam is betalactamase Inhibitor. Indications:Ceftricare™S Ceftriaxone Sulbactam is often used Treatment of cholecystitis, osteomyelitis, chronic suppurative bacterial otitis media, skin and soft tissue infections, gonorrhoea, chancroid, syphilis, UTI infections meningitis, nosocomial infection caused by susceptible bacteria. 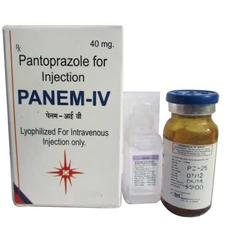 We are among the celebrated names in the industry, engaged in offering Pantoprazole Injections to our esteemed customers. It effectively inhibits the formation of acid in the stomach and is administered for the treatment of gastroesophageal reflux disease and ulcers. Formulated under the close supervision of experts, this medication is characterized by accurate composition. 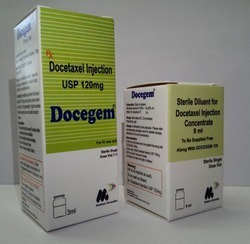 We offer premium quality Docegem Injection to our esteemed customers. These drugs are widely used to treat breast, ovarian, bone, prostate and non-small cell lung cancers. Highly motivated to attain optimum customer satisfaction, our team of logistics professionals assure delivery of these injections within promised time frame at the customers’ end. Our company is instrumental in offering finest quality Meropenem Injections. 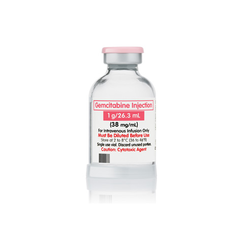 Extremely demanded in the international market, these injections are made available at affordable market prices. Highly effective against gram-positive and gram-negative bacteria, offered antibiotics are prescribed against skin infections, meningitis, septicaemia and adult febrile neutropenia. Indication:Gynecological infections, gynecological infections, skin and soft structure infections, meningitis, septicaemia and adult febrile neutropenia., skin and soft structure infections, meningitis, septicaemia and adult febrile neutropenia. We have been able to offer optimum quality Zolecare Injection to our valuable customers. 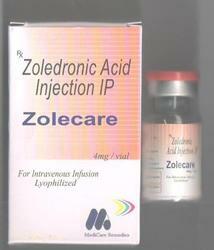 Zolecare Injection are widely used for treating pain from bone metastases. Zoledronic acid is a bisphosphonate that inhibits osteoclastic resorption of bone and calcium release induced by tumor cytokines. Zolecare Injection Available to us at highly affordable market prices, Zoledronic Acid injections are known for their optimum effectiveness. Sulbactam is able to inhibit the most common forms of beta-lactamase but is not able to interact with the ampC cephalosporins. Thus, it confers little protection against bacteria such as Pseudomonas aeruginosa, Citrobacter, Enterobacter, and Serratia, which often express this gene. 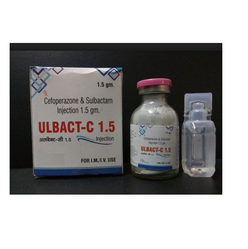 In the United States, sulbactam is combined to form cefoperazone/sulbactam and ampicillin/sulbactam. It does possess some antibacterial activity when administered alone, but it is too weak to have any clinical importance. We offer best quality Gemcitacare Injections to our valuable customers. These drugs are nucleoside analogs and are commonly used in the treatment of non-small cell lung cancer, pancreatic cancer, breast cancer and bladder cancer. Owing to their optimum effectiveness, these injections are highly demanded in the market. Non-small Cell Lung Cancer: 1000 mg/sq. meter IV infusion over 30 minutes on days 1, 8, & 15 of each 28-day cycle, OR 1250 mg/sq.meter IV infusion over 30 minutes on days 1 & 8 of each 21-day cycle Admin 100 mg/sq. meter IV cisplatin after gemcitabine on day 1. OR 1000 mg/sq. meter IV infusion over 30 minutes on Days 1 & 8 of each 21-day cycle With carboplatin AUC 4 on Day 1 after gemcitabine. Owing to the rich industrial experience in this domain, we have been able to offer optimum quality Meropenem Injections to our valuable customers. Processed in accordance with the FDA standards, these injections are widely used to treat various bacterial infections. These injections are available to us in bulk with tamper proof packaging. 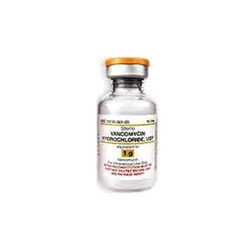 Owing to the rich industrial experience in this domain, we have been able to offer optimum quality Vancocare (Vancomycin Hydrochloride Injections) to our valuable customers. These injections are widely used to treat infections caused by Gram-positive bacteria. Our logistics professionals assure the timely delivery of these injections at the customers’ end.